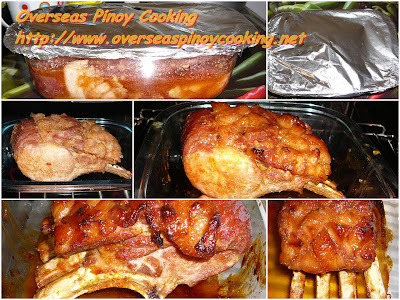 Pinoy Roast Pork, Tocino Style is my New Year special, it is another innovative dish that is uniquely Pinoy. Roast Pork is commonly serve in special occasions including the Christmas Season in the West and other parts of the World. Today I want to share to you a Pinoy version of a roast pork, that will surely get your attention. As I said this is another one of my innovative dish and it’s my first try of the recipe. As expected it did turn out great and I would strongly recommend to all and give it a try. For the pork roast ingredient I started with the smallest pork roast I could find. In fact I wanted a rind less pork roast but I could not find one. The 4 ribs pork loin roast was just perfect except of course it was with the rind on so I have to take the skin out, I wanted to leave some fat on but I was not able to skinned it uniformly as you can see on the photo. To prepare the skinned pork roast, slit cut the fats in diagonal patterns about half an inch diamonds. Then rub with a mixture of salt, sugar, garlic powder and paprika powder and let marinate for at least a day or longer the better. Baking it the usual temperature and timing, except that the pork roast has to be placed in the baking dish upside down and including the marinade during the first half of roasting. It is then flip over and continue to roast with occasional basting using the drips from the roasting pork. During the final stage of roasting the dripping is collected then thickened by boiling out the excess liquid. The reduced sauce is then use as glazing for the roast and used as sauce for the final product. 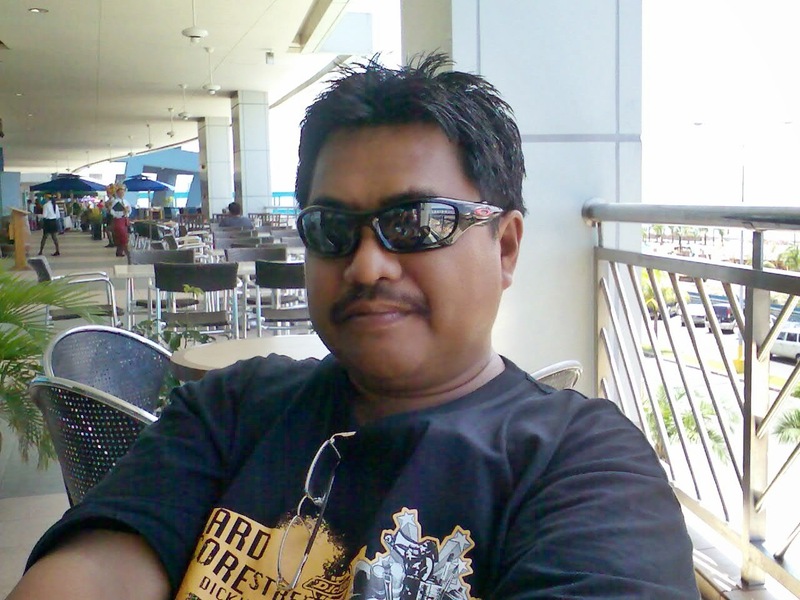 Do not worry about internal temperature, we Pinoys want our meat properly cooked so stick to the roasting times. The roast pork has to be set aside covered with aluminium foil to rest, this is to ensure that the roast pork is well cooked inside out. To serve I added more Pinoy twist, what would be the best accompaniment for tocino, sinangag (garlic fried rice) and sunny side up fried egg. To conclude the slits on the fat outer covering was essential for the marinade to penetrate the meat. It would have been better if the pork was left to marinate for a couple of days to reach to the center, but the reserve sauce dip will compensate it. Alternately during the last roasting stage the pork roast is sliced then individually applied with the glaze and continue to roast till done. 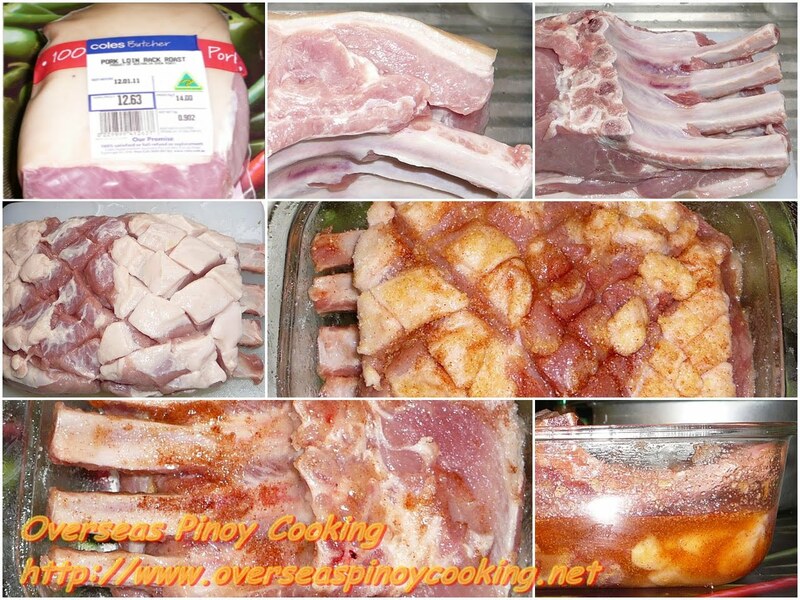 Here is the recipe of my Pinoy Roast Pork, Tocino Style. Remove the skin of the pork roast leaving most of the fat. Make diagonal crisscross slit cuts on the outer fat covering the size of 1/2 inch diamonds and deep enough to penetrate the meat and keep aside. In bowl mix the salt, sugar, garlic powder and paprika powder. Rub and coat the pork roast with the sugar mixture. Place the coated pork roast in a thermo glass loaf baking dish including the remaining sugar mixture, cover and place in the refrigerator and let marinate for at least 1day, occasionally turning over the pork roast for even marination. Pre-heat oven to 300ᵒF to 325ᵒF, take the pork roast out in the refrigerator and let stand outside till the temperature has increased to outside temperature. Ensure that the pork roast in the baking dish is positioned upside down and the fat and meat are facing the bottom of the baking dish, submerged with the marinade. Cover and seal the baking dish with aluminium foil and place in the rack at the middle of the oven and let bake for about 1 hour at 300ᵒF to 325ᵒF. Now remove the roasting pork from the oven and transfer in a larger baking dish, reserve the drippings, this time place the pork roast with the fats and meats facing up and the ribs facing the bottom of the baking dish. Return to the oven and roast for about 20 to 30 minutes at 350ᵒF to 375ᵒF monitoring the temperature, decrease the temperature as necessary. In the meantime using a small saucepan reduce the reserved drippings to a syrupy consistency. Using the syrup baste the roasting pork about halfway then again on the last 2 to 3 minutes of roasting increasing the temperature to about 400ᵒF, this will result a glazed and seared effect on the fats. When done remove from the oven and cover with aluminium foil and let stand for about 10 minutes to rest. To serve slice individual ribs, arrange in a platter with garlic fried rice and fried egg. And pour over a couple of tablespoon of the syrup. This really looks so good. So after a Pinoy's heart. You know how we like our pork to be sweet and sticky. Sure it is, and delish also, welcome to OPC. hi. if im going to cook 6 kilos of roast pork? how long shall i put it in the oven? I have not tried to roast meat that much. There are a lot of guides in the net, I hope that will help. Just Google "Roast Pork Cooking Times". it will be ok if ill use just belly pork slices ?